The Vinamor is a wine aerator unique to the wine industry. This single-glass aerator design is the innovation of Gary DeJohn, who has worked in the fine-dining service industry for five years. Because Gary understands and appreciates how decanters and aerators can affect a wine’s palatability, he applied that knowledge to create an easy-to-use, dishwasher safe model that can be used anytime. 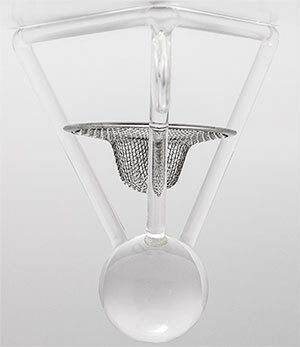 The Vinamor sits neatly in the top of every wine glass and is distinguished by a glass sphere and stainless steel filter. As wine is poured over the sphere, the Vinamor exposes it to the greatest amount of surface area, allowing tannins to soften and the desired flavors to flourish. With many large-based decanters, wine can take several minutes or hours to properly breathe and achieve the same result. By contrast, the Vinamor’s aeration method allows for immediate wine enjoyment. The filter catches any sediment or particles that may be present, preventing them from entering the wine glass. Copyright © 2019 Vinamor Wine Aerator - The Shark Tank. All Rights Reserved.